What do house design, midwifery, blacksmithing, dress design, skateboarding videos and refurbishing cars all have in common? They are just some of the Branching Out projects in progress this year at U-32! Each year, 25 high school students chose a topic they’ve always wanted to study, and with the help of advisors in school, and a mentor in the community, they pursue that passion. Eighth graders get a chance too, as a second semester elective (look for that story later this year). The experiences students pursue through Branching Out are limited only by their schedule,the mentors we can find in the community, and their imagination. We are immensely grateful for this very creative, friendly community and the hundreds of mentors who have helped students over the years. Here’s a spotlight on this year’s studies. Learning to communicate and sharing their ideas in new ways, we have Fiona Astle and Ciel May studying Japanese with Minori Hirayama, Eli Pandolfo speaking Italian with Vivian Infantino and Bradley Smart challenging himself to new levels in photojournalism with Roger Crowley. Regina Thompson is getting more structured time to speak lots of German with her son Sam as they work together on an advanced German language study. Making the world a better, safer place, we have Anthony Rieder riding along with Corporal Chris Quesnel from the Northfield Police Department and Signe Goddard reaching out to find out more about social work and helping those in need. Here at U-32, with the help of faculty member Laure Angel, Emma Curchin has started a Women’s International Issues Club (WIIC) in which an enthusiastic crew of U-32 students, both male and female, are discussing some of the most pressing issues for women worldwide, and planning to take action to help. See Emma if you’d like to know more! Ava Clithero is learning guitar from Colin McCaffrey, and getting coaching on her original songwriting. We are looking forward to hearing Ava’s passion for helping the planet come through in her songs! Branching Out is a great forum to delve into something that might be your career interest. Brenna Connor is continuing her work in architecture by working with Michael Horowitz at U-32 and Jeff Stetter from Gossens Bachman Architecture on designing an energy efficient home (for a client!). Homebirth midwife Jen Pia Needleman is working with Emily Capron, who is getting the amazing experience of tracking a client through her pregnancy. Bailey Howarth is working on a palette of original tatoo designs with mentor Greg Wood, from Bury the Needle Tatoo in Barre. Ford Porter is helping his grandfather Bill Porter manage a portfolio of stocks, getting ready to do some buying and selling next semester. 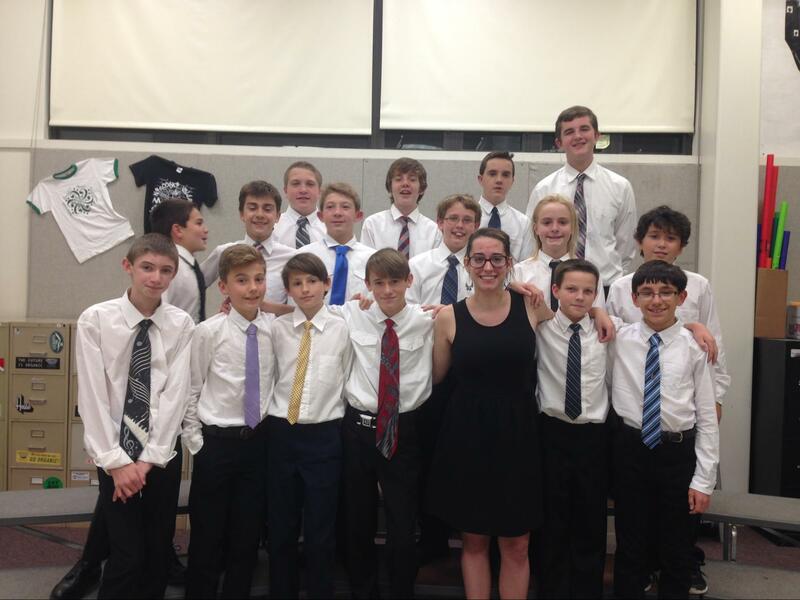 Tillie Quattrone was on stage at the last Middle School Music Concert, conducting a song with the boys chorus, with help from Roger Grow, as she learns about choral directing. Elysian Gomes is pulling together his portfolio for fashion design schools, and it will include original designs and garments constructed under the guidance of bridal gown designer Shaline Kirkpatrick Bennett. Branching Out can also be a way to try something new, just for the fun of it, or to deepen a longstanding interest. Talk to Eliza Merrylees who is a new accordion player thanks to Jeremiah McLane and Rick Winston. Or Odgen Hersey who is rebuilding and refurbishing a Mercedes (and maybe a go cart) with Keith Brown from Uttons. Blacksmith Steve Bronstein gave Henry Hoffert his first hands on experience in forging–and Henry has a handmade hook to show for it. U-32’s own Steve Barrows is helping Sam Wooliever craft an original graphic novel…stay tuned for the adventures of “Black Beetle”! Grace Dellinger-Pate is taking the year to reach for some longer range goals in her journey as a French Horn player, with mentor Lydia Busler, Marie Russ is making time for more Creative Writing, with encouragement from writer Laura Williams McCaffrey, and Anna Davis-Noe is exploring drawing and painting with portrait artist August Burns. Finally, Taran Clammer and Tanner Cameron are weaving together long standing interests in original music (for Taran) and skateboarding (for Tanner) into a joint project. With advice from videographer Kevin Murakami of Champlain College, they are creating an original skateboarding video with an original score, and taking advantage of the lack of snow to practice new skateboarding tricks to include in the video. Congratulations to all these students for taking the step to pursue their interests, and a huge thank you to everyone who is helping them do it–parents and mentors! If you want to join the fun, contact Karen Liebermann about applying for next year.